Social selling is an innovative method of conducting business in the social media age. With the saturation of readily available content and copycat business strategies, the task of generating and converting leads into customers can be quite a challenge. Getting social sales results can be a confusing proposition without proper insight. There isn’t necessarily a clear-cut map to what makes your social selling a success. So, then, what makes or breaks social selling efforts? Success always starts with the end in mind. Setting goals based on feedback and data is the first step to any successful venture. For social selling success, feedback can come from leads, customers, or sales representatives working directly to satisfy individual needs. Don’t underestimate the seller’s insight, as they often see issues and questions your marketing team may not. Data collection and analysis is essential for the success of any goal, whether sales or otherwise. Social selling presents unique obstacles to data collection that often make the task seem intimidating. Nevertheless, without the ability to measure progress, even the best plans can be catastrophic failures. Your social marketing team should be generating relevant content that sellers can use, which forms the most basic tool for social selling. However, third party social media organizational tools like Hootsuite, LinkedIn, Nimble, or other similar tools can be of great benefit to your sales endeavors. Using these plugins, overlays and applications can help your team stay organized and deliver more value to your customers. There are also many social media tools for capturing and organizing statistics and other data to better help you analyze results. Using these tools can keep you on track with your overall goals without the headaches of compiling them from scratch. Advancements in social media innovation provide some clues about cutting edge tools such as chatbots and automation. While neither can completely replace the human element of your sales team, they can be an invaluable resource to streamline your sales funnel. Despite automated technologies becoming more popular, the foundation of social selling success will continue to be rooted in contextual marketing for the foreseeable future. Delivering targeted ads based on the personalized trends of each individual improves the quality of leads as well as the customer’s overall experience. Training your sales team to use the tools available is a major factor in success. However, it is just as important that representatives understand how to gauge and track buyer behaviors to turn leads into satisfied customers. Buying behavior is a vast topic on its own, and applying it to social media methods can be an involved process. At a bare minimum, you should know where your customers go for information, how they arrive at your page, and where they click once they’re on your site. Training your team to ask the right questions can help add to this perspective as well. Understanding your customers’ habits, needs and experience as well as equipping sales representatives with the tools and knowledge relevant to your goals will make the difference between success or failure. 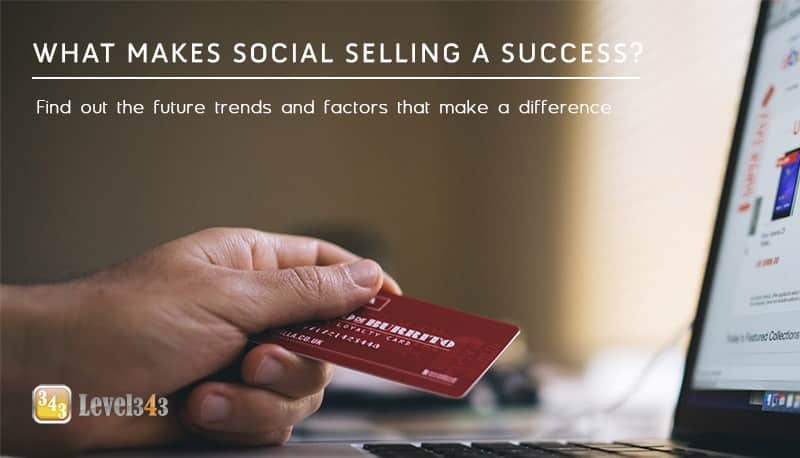 As social methods in general have only just begun, setting up the framework for social selling success will be an important business strategy for years to come.